Jeff Wilkes worked for years at Bien Nacido Vineyards and was a close friend of the Miller family who founded the vineyards. He started his own label in crafting small lots of Pinot Noir from the Bien Nacido Vineyard. He crafted an excellent Pinot Blanc from Bien Nacido Vineyard as well. 1984 was a seminal year for Wilkes and Bien Nacido Vineyards. He had just accepted a position with Bien Nacido Vineyards to help market the grapes produced there during one of the largest grape gluts in California history. He was reviewing the wines produced from the vineyard and tasted the only red wine produced from Bien Nacido-grown Pinot Noir. Most of the Bien Nacido Pinot Noir was made into sparkling wine at that time. However, the 1982 Austin Cellars Bien Nacido Pinot Noir had just been released and not only did he feel that Pinot Noir was the future for Bien Nacido but he knew that was his future. During his 18 years at Bien Nacido Vineyards, his goal was to make Bien Nacido recognized as one of the premier Pinot Noir vineyards in the country. Along with the marketing and sales of the grapes, he focused on improving farming techniques and upgrading the trellises. He spent a lot of time on the road visiting other vineyards throughout the state. He looked at what other vineyards were doing, tasted the resulting wines and then brought this research back so that we could take advantage of the best techniques around. During this time, he tasted the best Pinots from Bien Nacido, as well as examples from all over California and France. Because he was spending untold hours visiting wineries and talking with winemakers, he developed a real sense of how he personally wanted to produce wine. In 2001, he decided to venture out with the goal of making world-class wines. Initially, he limited his production to Pinot Noir from Bien Nacido but he always had the goal of working with the finest vineyards along California's Central Coast. In 2003, he expanded his horizons a bit and added Pinot Noir from Solomon Hills Vineyards in the Santa Maria Valley and Vall-Foss Vineyards in Napa Valley. He also wanted to produce a white wine so he added a Pinot Blanc from Bien Nacido in 2004. The Pinot Noirs are perfectly fine Central Coast wines showing admirable restraint and elegance. The Pinot Blanc is also quite good, although Pinot Blanc, a mutation of Pinot Noir, is often overlooked by white wine drinkers. When Jeff passed away, the J. Wilkes brand legacy continued under the direction of winemaker Vidal Perez, focusing, as Jeff did, on Pinot Noir, Chardonnay and Pinot Blanc, but with appellation designations. Vidal is a graduate of California State University at Fresno in Viticulture and Enology and is an assistant winemaker at Central Coast Wine Services where Jeff made his wines. 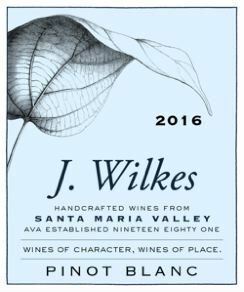 The latest information in the summer of 2015 indicates that winemaker Wes Hagen, who has been out of a job with the lease of the Clos Pepe Vineyard to WALT Wines, will revive the J. Wilkes brand. He became the consulting winemaker and brand ambassador for J. Wilkes Wines. The wines are sold through a mailing list, the website, and through tasting rooms in Santa Barbara County.